When we moved to our current home ten years ago, I put up a post that was clearly visible from our dining room window and hung a bird feeder. In other places where we have lived that kind of feeder drew a variety of interesting little songbirds. Here it drew mostly magpies and grackles, noisy and greedy birds who scattered the seeds looking for the ones they wanted, and scared away the small birds. We stopped filling that feeder. We had more success with a thistle seed feeder hung from the same post; we love to watch the goldfinches float down from the trees and compete for a spot on the feeder. 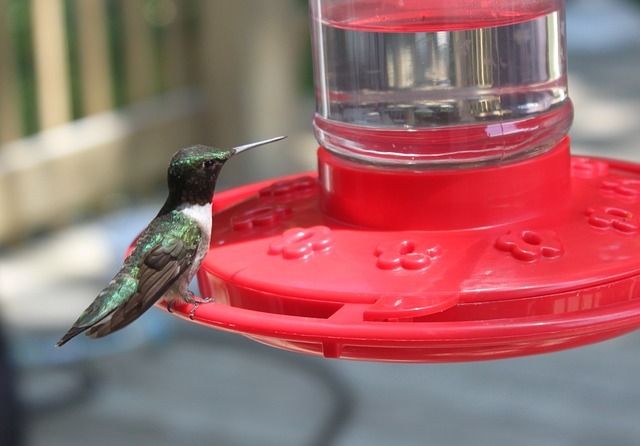 We put a hummingbird feeder on the other side of the house and it didn’t take long for the little hummers to find it. Occasionally an oriole would come and drink from it. I saw an oriole feeder at Canadian Tire – same principle as the hummingbird feeder but larger holes. It seemed like a great idea; I bought one. The first summer it attracted wasps, who prevented any birds from coming near. Many of the wasps managed to crawl down the tubes to get closer to the nectar, and drowned. It turned out to be an effective wasp trap, but that hadn’t been our intention. This year we tried the oriole feeder again. Within a couple days there were a bunch of dead flies floating on the nectar inside. We took that feeder down and gave up on it. Yesterday I took down the unused birdseed feeder, drove a spike through a scrap wood block and screwed it to the bracket the bird feeder had been sitting on. Then I impaled a half orange on the protruding end of the nail. It didn’t take long for an oriole to find it. They seem to be happy, and so are we. and your sinuses, and your throat. The forest fires in British Columbia are still burning. The smoke has wafted in other directions for the past several weeks, but yesterday and today it is back in our country. There is a blue haze in the air, accompanied by a faint aroma of burning evergreens. Elderly people and those with respiratory allergies or impaired immune systems are advised to take precautions. I qualify on two of those counts and have been taking double doses of antihistamines all summer. We are two provinces away, imagine what it must be like in B.C.! One side benefit (?) is that the smoke filters the sunlight and moderates our temperatures. From there, I went across the street to the coffee shop to have a latte. The young lady behind the counter asked me if it had been a busy day at the vet clinic. What? I had to ask her how she knew I had been at the vet clinic. It turns out she had spent a few days there as a work ed student while in high school. Okay, the light began to dawn, I do remember seeing her there. And she made a super latte with the perfect design in the cream on top, just like you see in pictures. Pine siskins have been mobbing our thistle seed feeder for several weeks now and the goldfinches seemed to have disappeared. Today we saw a goldfinch, but there wasn’t room for him at the feeder. I guess they have been crowded out from our feeder and are most likely going next door. We have hummingbirds fighting for a turn at our hummingbird feeder. These are the young from this year and it seems that there is always one male who is boss and won’t let the others near until he has had his fill. Nature is not all sweet peace and harmony.